Discover now has compact view, fantastic ♡ , before i only could see 5 listed apps in my screen (1366×768). Keep it up guys! I appreciate the effort but I’m really bothered by the recent trend to “reinvent” vertical tabs. This was a thing people at Apple already tried 40 years ago and realized that it’s a usability nightmare. That’s when tabs above the view were invented, that actually look like folder tabs. The vertical tabs in KDE Settings windows are not a new trend; they’ve been there for a decade or more. Also, Apple still uses them! Check out for example System Preferences > Accessibility and System Preferences > Keyboard > Shortcuts. I’d like to add that most IDEs use vertical searchable tabs (sometimes trees), along with horizontal tabs. This allows grouping / classifying information on both axes. 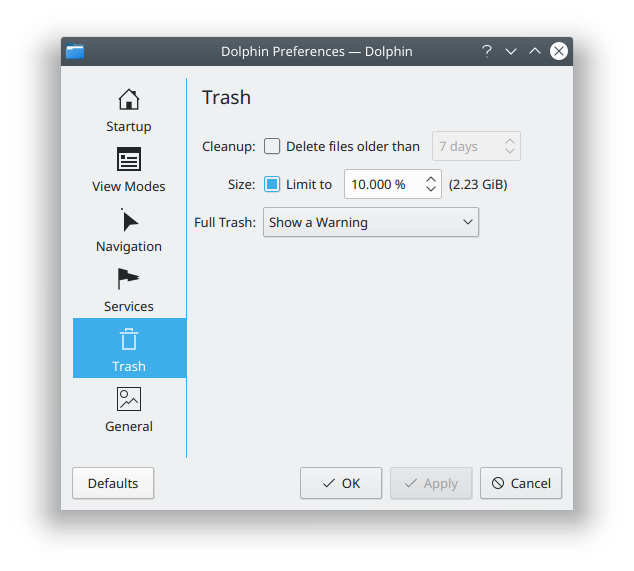 It may be unnecessary in many cases, but the Dolphin settings are pretty clean for the options it presents. I’m glad to see all these changes, nice job! By the way, in Dolphin I’ve discovered a bug, let me give you some feedback. When I disable all the services of root options since context menu, and then right clic on folder space, still appear root options without list the dropdown because before they were disabled. Please submit a bug report to the developer of the Root Options service. Hi Nate, these are words of the developer: “I can confirm the behavior in dolphin. However, that part is handled by the file manager (and not by the service menu), so technically it is a bug in dolphin (which I cannot affect by the menu code). Seems like the bug doesn’t affect krusader, for example, so it’s likely specific to dolphin code.”. I have one suggestion and please let me know how I could move forward with this – bug report or something else. 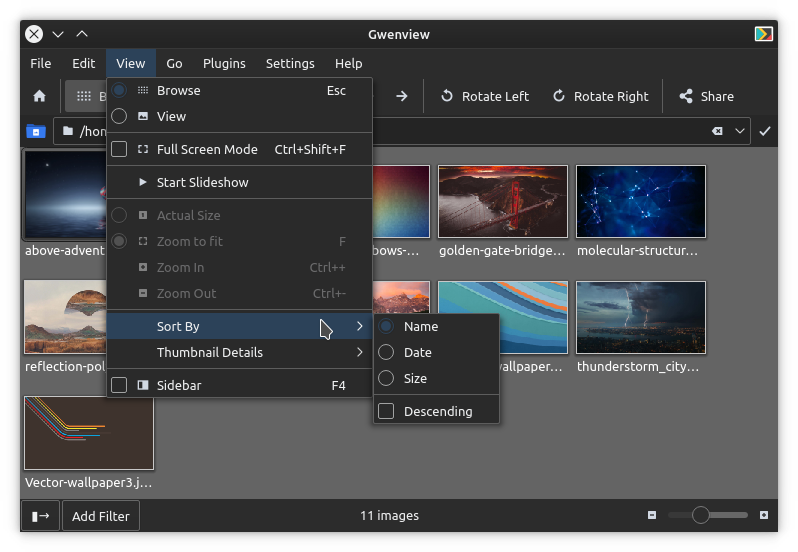 In Plasma and KDE apps the mouse usually scrolls 3 lines, where a line can be a lot of things: a line of images, a line or column of folders, a line of text etc. My problem with this is that all these scrolling views, except for text, are way too sensitive and if I pull on the mouse wheel once I end up at the end of the folder for example, so I need to be extra careful to scroll one wheel click at a time which is frustrating. It seems natural to me that a line should always be the width of a line of text. This already seems to be the case in Kubuntu 18.04 in the “Folder View Settings/Wallpaper” when scrolling through the images. I’d like that scroll to be implemented in other image and folder related views. Now if you click on “Add image…” an Open dialog appears. Set view to Short and Zoom to max and it’s easy to miss entire columns of images even scrolling carefully, so I always need to grab the scroll bar. I simply can’t trust mouse scrolling in KDE apps. This bugs me too, a lot! Especially scrolling in Gwenview’s browse mode – its sensitivity is just crazy. What theme is Farid using in the screenshot of Gwenview? That really looks neat! Looks like Breeze Dark with Papirus icons. 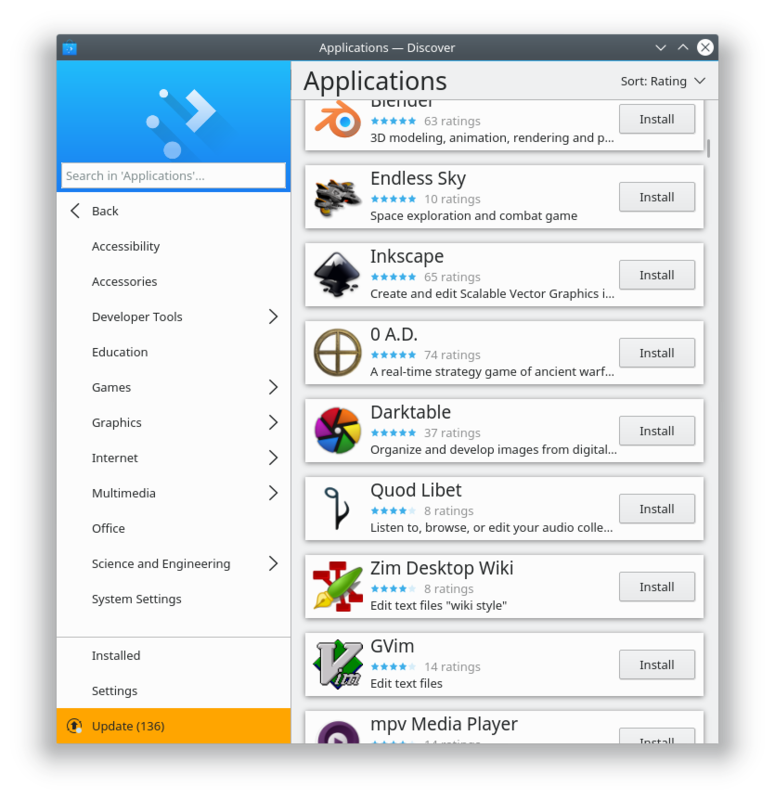 Nevertheless, i love what you guys are doing – KDE and Plasma is simply awesome! Breeze with Obsidian Coast color scheme I think. When I want to open an ISO file, I right click on it, do “Open with…”, the dialog opens, to choose the software I want. I type “ark” to use… yeah, Ark. I press ‘enter’ and “Darktable” starts, because it’s at the top of the list of the proposed apps. The apps should be sorted differently, to show at the top either the apps with the lowest levenshtein distance, or the closest starting from the first char. Please file a bug against frameworks-kio! Plasma 5.13 is out and in a fresh version has tons of bugs. Is there a place to submit them or just go to KDE bugtracker and do one by one? I hope some of them are already submitted but searching for bugtracker is pain and I can’t see anything. Is there a way to see newest submits in order they are submitted to see which ones are related to Plasma 5.13? Also, should I submit a bug about lack of global menus in firefox/thunderbird? I saw them working on Neon Developer Preview, but on Manjaro after Plasma 5.13 there is no change, menus for those programs don’t work. Or maybe we need to install and set something to make them appear? Or maybe the unity patch is not working on non ubuntu based distros? Is there a way to check it? Yeah, it only works with Firefox in Ubuntu-based distros, where Canonical has patched support for this feature into Firefox and Tunderbird. Other distros like Manjaro don’t have these patches, so it doesn’t work there. This is not what the commit does. The commit disables the triangle in the bottom-rignt corner of the window “by default”. You have (thankfully) removed nothing. Indeed, it is simply disabled by default now. I was writing primarily for a user audience here, but I think you’re probably right that different language might have been more appropriate. Either way, I figure that technical people can always read the commit message and find out for themselves what was changed.